Cyclamen persicum is a common geophyte of the eastern Mediterranean. It is the national flower of Israel. A typical winter-pending flower that protects its anthers from the rain. Excellent details in the flowers, very well detached from the dark BG; I really like it! You have shown very well this flower with it's delicate colors. The white of the petals is nicely rendered and the delicate shardows creates a nice 3D effct. Hi Ori. This is pure art. They look 3D on my computure . Fine detail and colours with spot on exposure. looks good against the BG. well done TFS. Tr�s beau clich�, avec une belle restitution des couleurs et des contrastes remarquables. Very nice composition in cyclamen! P.S. Where does one find cyclamen in Yaffo? Lovely close up.Well seen and composed. Siyah zemin �n�nde m�thiş bir �i�ek. Enfes bir sunum. Eline sağlık. A very interesting and attractive petal structure on this Cyclamen. I didn't know that this was Israels national flower. 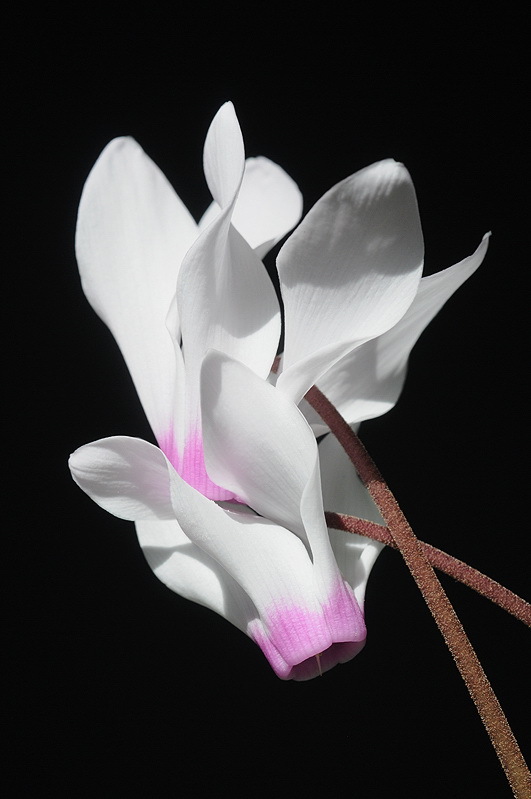 This Cyclamen is very beautiful .Your composition is very clear and the contrast between the colors is really attractive. Ps . Thanks for your help. :) ... I see you have a lot of beautiful flowers in Israel. Hi MF Ori! Good Morning! A fine macro capture of a bunch of cyclamen from a nice pov with great details, sharpness and composition. magnifique lumi�re rendue. L'exposition est parfaite. Tr�s beau contraste entre le fond noir et le blanc des fleurs. La mise au point est excellente , les d�tails des tiges impressionnants. One of my favourite flowers in a perfect vertical composition Ori, TFS indeed my friend! Superb detail in this close-up! Excellent exposure too, those white flowers can be tough to expose well. Splendide macro tr�s artistique, tr�s finement d�taill�e et d�licatement color�e.